North Korean leader Kim Jong Il's eldest son has for the past three years lived in Macau, where the United States slapped sanctions on a bank for allegedly helping Pyongyang launder money, a news report said Thursday. Kim Jong Nam has stayed in five-star hotels in the Chinese territory, while his family has resided in a villa, the South China Morning Post reported, quoting unidentified sources from a six-week investigation. The 35-year-old man has also been seen gambling in casinos and dining in restaurants, the paper reported. The Japanese newspaper Yomiuri Shimbun published a similar report on Wednesday with a photo that allegedly showed the pudgy younger Kim wearing a brown zip-up sweater and sunglasses outside a building in Macau. An official at Macau's Government Information Bureau, who declined to be identified because she wasn't authorized to give her name to the media, told The Associated Press, "We don't have any information about this" report. One diplomatic source in Hong Kong, who asked not to be identified because of the sensitivity of the subject, told the AP that the younger Kim occasionally visits Macau. But the source could not confirm that Kim Jong Nam lived in the city. In Seoul, South Korea, the Unification Ministry, which handles inter-Korean affairs, and the top spy agency, the National Intelligence Service, also said they could not confirm the report with independent sources. But a man in the United States who has close ties to Kim Jong Nam told the AP in Seoul by telephone that one of the younger Kim's aides in Beijing informed him on Thursday that Kim would leave Macau that same day to visit nearby Hong Kong. The trip to Hong Kong takes about an hour on a high-speed ferry. The man, who said he has developed a close business relationship with the North Korean leader's son, said Kim has been moving around "busily" since early January, preparing for his father's birthday on Feb. 16. North Korea has bank accounts in Macau and Hong Kong, said the man, who asked not to be identified because he feared his relationship with Kim would be affected. 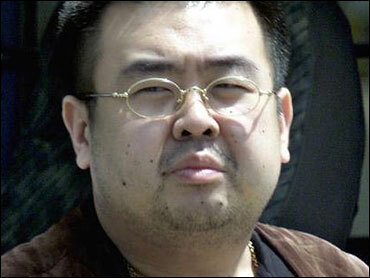 Kim Jong Il is known to have three sons. Some believe Kim Jong Nam has fallen out of favor after embarrassing his father in 2001, when he was caught trying to enter Japan on a fake passport, saying he wanted to visit Tokyo Disneyland. North Korea has long had close ties to Macau, a former Portuguese enclave that is trying to shed its reputation for being a seedy casino city plagued by gang violence. In recent years, Las Vegas gaming companies have started massive casino-resort projects with the aim of turning Macau into one of Asia's top tourist spots. The United States has alleged that a Macau bank, Banco Delta Asia SARL, helped North Korea in money laundering and counterfeiting activities. Washington imposed financial sanctions on the bank in 2005, prompting North Korea to begin boycotting discussions to disarm its nuclear program. The talks were recently restarted.